She recently invited us to her studio in Beacon, New York, to discuss the relationship between real nature and images of nature, integrating our lives and bodies with the world around us, and bringing different cultures together through art. This post is part of an ongoing series of short interviews on contemplation and creativity. 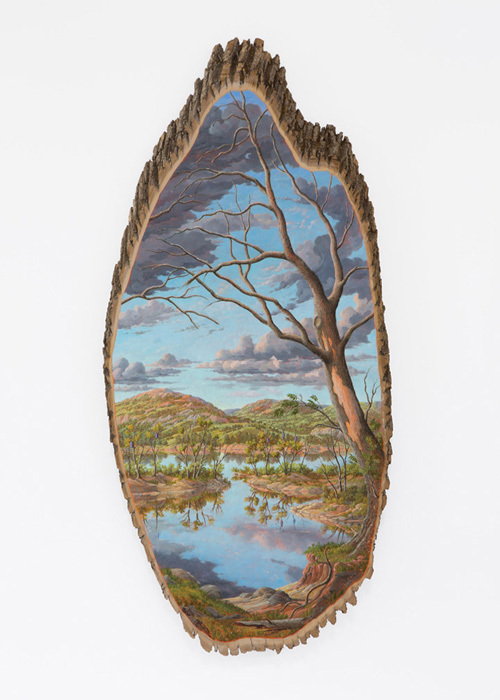 In your log paintings, you paint pristine natural landscapes on log slices. Any romantic ideas we might have about the landscape are undercut by the log canvas, which implies a disconnection between what we imagine and what’s real. Can you talk about that tension? I hope to show that there is a vast difference between real nature and an image of nature. I’m not saying, “We should never chop down trees.” I am saying that conservation, forestry, issues concerning the environment are complex, requiring greater awareness and keen observation on our part to find solutions and to implement wiser practices. 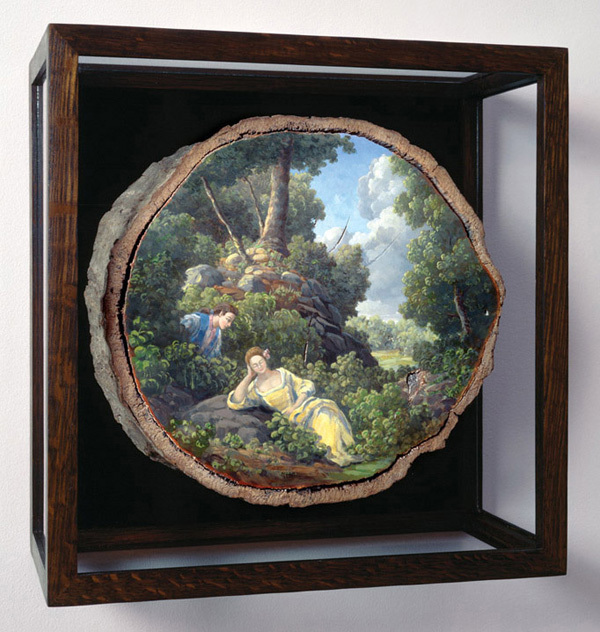 When I first began to paint idealized landscapes on sections of real nature, people were often more intrigued by the log than the painting. They would ask me questions like, “Why is there space between the bark and the wood,” or “What are those cracks?” They were used to seeing images of nature, but they had never taken the time to look at an actual log with bark or notice the true behavior of wood. People had more questions about the log than about the painted image. This reminds me of the selfies taken in nature today. Capturing or snagging the photo is of more importance than really observing and seeing the natural environment. The selfie image now stands in for a real experience in nature. Work by Alison Moristugu ranges from $6,400-$68,000. Alison Moritsugu's exhibition, inconsequence / in consequence, at Littlejohn Contemporary (New York) continues the artist's exploration of human interaction with the natural world and with a changing environment. Her works focus on how seemingly small changes in this relationship can have potentially larger implications in the future. The exhibition includes paintings, works on paper, wallpapers and sculpture. Moritsugu skillfully weaves together art historical tropes with present day environmental concerns to examine our past and present relationship with the land. 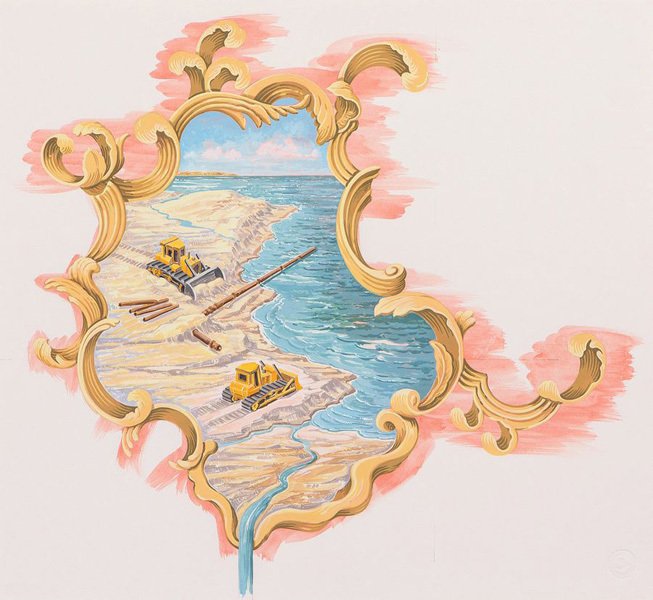 Littoral Folly, a decorative wallpaper with scenes in rococo vignette depicts images of tractors replenishing beaches, concrete shore barriers, tsunami sirens and houses built on stilts. The folly is that the shoreline is where land and sea merge, forever shifting. It will never remain as a defined, permanent boundary despite human effort to keep it that way. 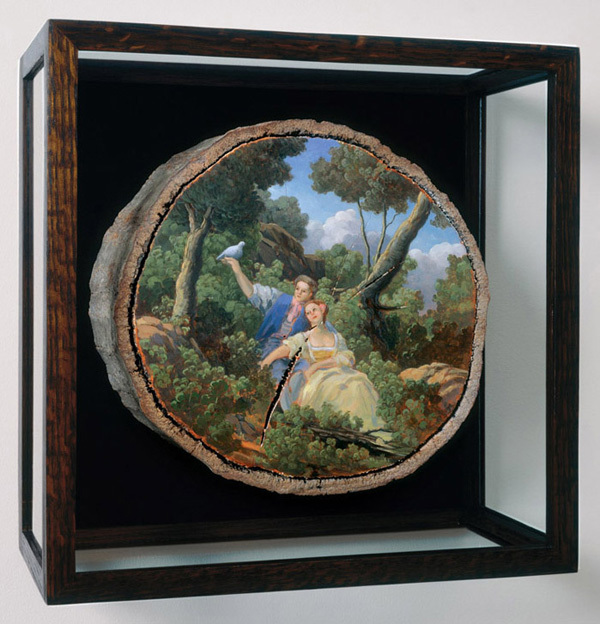 Moritsugu's ongoing series of log paintings on tree slices with bark intact, examine contrivances in landscape paintings of the 18th and 19th centuries. Two new companion works titled Remnant and Vestige, have been painted on ash, each log comprised of 77 growth rings. The ash tree is being decimated by the emerald ash borer, an invasive insect from Asia. A spectacular new work in the exhibition is a large floor piece titled Talisman. This sculpture, with a highly polished surface, has been "tattooed" – carved into and inlaid with black. The images are motifs from old sailors' tattoos caught in maelstroms of nature. 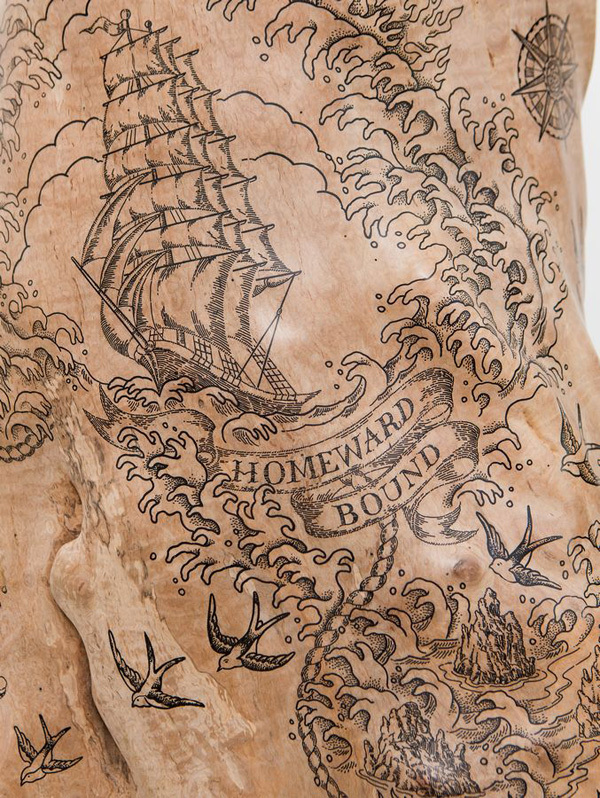 Historically, sailors tattooed themselves with ships, propellers, stars, swallows and pigs – symbols for hope and protection from dangerous storms. Moritsugu created modern versions using environmental terms such as "resiliency," "adaptation" and "mitigation" – words now associated with climate change and rising sea level. Moritsugu is originally from Hawai'I and during return visits has kept track of changes she's witnessed in the landscape. 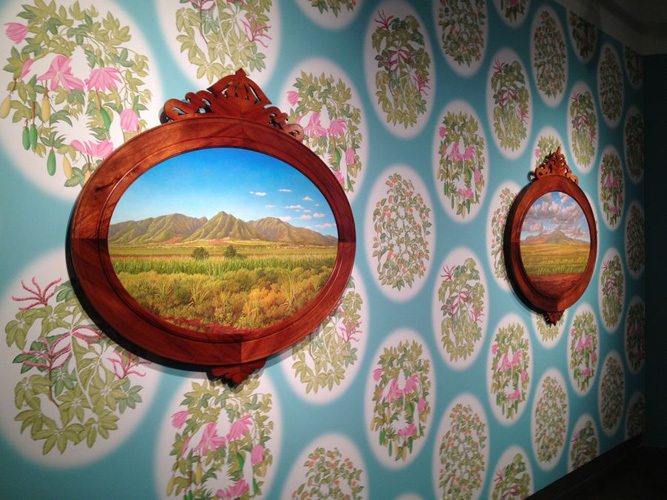 Big Pineapple and King Cane, two oval paintings in koa frames, depict scenes of the few remaining pineapple and sugarcane fields in the islands. They are a nostalgic documentation of the once plentiful agricultural land which is steadily being converted into housing developments. Chaparro Repeat is a wallpaper done while Moritsugu was on a residency near San Diego, not far from where the Cedar Fire burned in 2003. 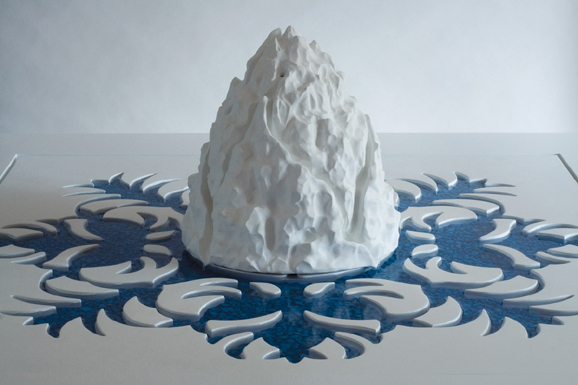 Alison Moritsugu's work has been exhibited in solo shows at the Honolulu Museum of Art at First Hawaiian Center; Lux Art Institute, CA; John Michael Kohler Arts Center, WI; and the Knoxville Museum of Art, TN. Group exhibitions include the Maier Museum of Art, VA; Palmer Museum, Penn State University, PA; Virginia Museum of Contemporary Art; Frost Art Museum at Florida International University; and Kemper Museum of Contemporary Art, MO. In 2011, she completed a mosaic commission for the MTA Arts for Transit. Moritsugu received a BFA from Washington University in St. Louis, Missouri and an MFA from the School of Visual Arts in New York. The artist has been represented by Littlejohn Contemporary since 2000. She currently lives and works in Beacon, NY.